Front facing camera surely is one of the prime considerations when choosing a smartphone, and to further reinforce the importance of the feature, DxOMark too has stated they would henceforth be testing and grading the selfie cam as well when reviewing smartphones. The DxOMark Selfie test protocol testing process includes shooting approximately 1,500 images and dozens of clips totaling more than two hours of video. The Google Pixel 3 and Samsung Galaxy Note 9 share first place in the new ranking, tying on a score of 92 points. DxOMark says the new Selfie score is arrived at 'using a dedicated scientific protocol based on both objective measurements and perceptual analyses of images taken with the tested device'. 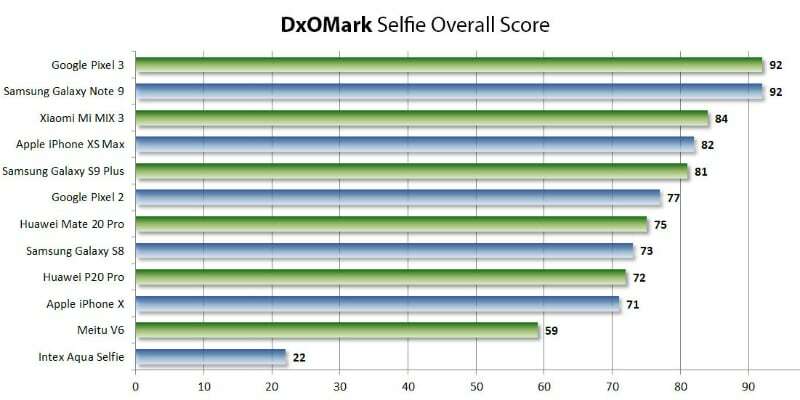 However, the DxOmark scores shouldn't exclusively be the deciding factor while purchasing a selfie-oriented smartphone. This means that it consists of still and video testing. DxOMark has released a list of the best phones in the world for taking selfies. Self-portraits are also analyzed for bokeh effect, noise, and dynamic range. The Note 9 makes do with a single selfie camera. DxOMark said that Google Pixel 3 is slightly better in focus, and Samsung Galaxy Note 9 gives better exposure and color. DxOMark states that the Pixel 3's camera dominated with extremely detailed selfies while Note 9 goes for a cleaner selfie approach. And found to be equally good is the Samsung Galaxy Note 9. The Mi MIX 3 (84 points), iPhone XS Max (82 points), Galaxy S9 Plus (81 points), Pixel 2 (77 points), Mate 20 Pro (75 points), Galaxy S8 (73 points), Huawei P20 Pro (72 points), iPhone X (71 points), Meitu V6 (59 points) and the Intex Aqua Selfie (22 points) were ranked third, fourth, fifth, sixth, seventh, eighth, ninth, tenth, eleventh, twelveth, and thirteenth, respectively. The overall scores can be seen below. Hence, figuring out which phones succeed in terms of providing you with the highest quality front facing cameras possible is very important indeed because of the fact that it can help you make a decision regarding which cameras you want to eventually go with when you are making a purchase.